Note: A few days ago, my daughter and I planted a hundred milkweed seeds along the edge of a wood. We watched for rain and imagined the seeds putting down tiny roots. We hope for a dozen milkweed plants come spring. We hope monarchs hear the milkweed song and come dancing along. Have you a kind act to share? Today’s Little Ditty has a challenge from editor Rebecca Davis to write “a poem about a specific act or moment of kindness. You can write it from any point of view– as a participant, a beneficiary, or as a witness. The more specific and vivid, the better!” Some of the poetry will be published by Today’s Little Ditty between now and Thanksgiving. I will look for it. My mother-in-law tells a story of a tree full of thousands of monarchs in California when she was newly married. I would have loved to have seen that. Yes, these seeds will be beginning for something good. Great and thought provoking. Loved the image, too! Thanks. It’s a special memory, and I’m glad others appreciate it, too. Thanks, Beth. She was so cute with the seeds. They would fly up, and she would catch them and pat them back into place. We have let the fields in front of our house go wild, and milkweed blooms every year. And the butterflies visit. Its the little things that make life beautiful. So true! Good for you. I wish we had some wild meadows here, but nearly everything is mown and used for yards or playing fields. Thanks! I hope I’ve picked good spots for the seeds. Reblogged this on Coalition for American Wildbirds. Beautiful. I hope the milkweed works. We have some, but we didn’t see any monarchs until the very end of the season. At least you saw some. I haven’t seen any since I was a kid, and we had milkweed in the swamp behind our house. A lovely thought – and poem. I particularly like the emerald twilight… and how it winds hope about itself. Thanks, Kat. I gave it to Michelle at Today’s Little Ditty. I hope she like it, too. I hadn’t tried to write a kindness poem before. I might have to write more, it was a good exercise. Monarchs will only lay their eggs on milkweed, and milkweed is getting squeezed out by over-gardening. We need our wild areas. My neighbors and I are all trying to allow the milkweed more space in the hopes the monarch will come back. Wonderful post, Brenda. 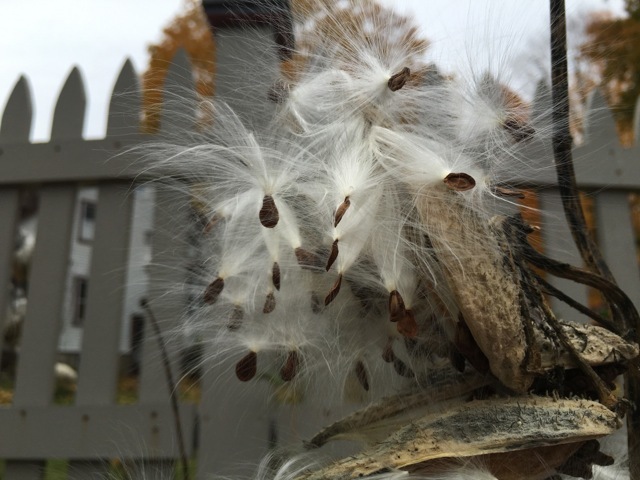 That image of the seeds really popped out at me, as well as some creative expressions, “…it winds hope about itself ” and a “green place of wishes.” I hope your wish comes true and the monarchs hear the milkweed song coming in the future.